My music teacher in elementary school was Mrs Orr. She was a lovely, Israeli woman with a graceful neck and blonde hair. I liked her. She would stand on the stage and move her hands in time to the music, her face shining light and smiles as she introduced us to classic Israeli songs in Hebrew and English. Songs about hope, peace, and land. Songs that told stories of Moses, young pioneers, Jewish holidays. Shining sea, green mountains, sweet oranges and laughing children. 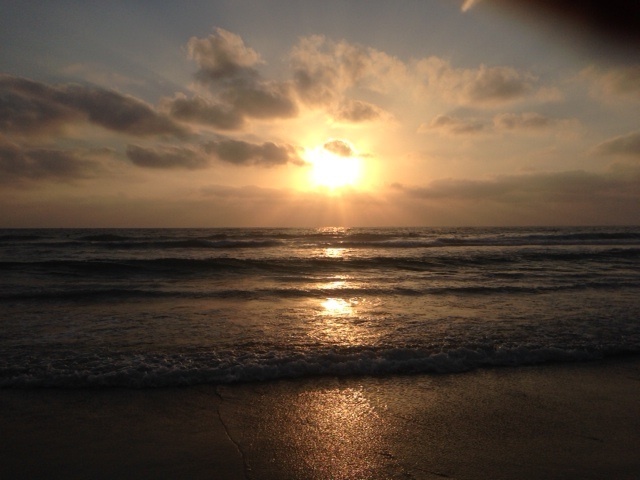 “Al Kol Eleh – For All These Things”: my favorite Hebrew song. Music and lyrics by Naomi Shemer. Performed by dozens of famous and not-so-famous singers, including the Carmel Primary School choir in Pretoria, South Africa circa 1984, 1985, 1986. Loved by me from the first moment I heard it. The melody flows like a gentle stream, the words sound and feel beautiful and comforting even if they’re not understood, the tears pool in my eyes, and the back of my throat catches as a soft smile plays on my lips. In 1984. And in 2014. And all the times I’ve heard and sung it in between. Al biteynu hatinoket shmor eyli hatov. So sweet. And so bitter. Wine and pizza and night-time play in the park. Siren. Boom. Then boom again. I never fear for our safety, but the siren is loud and the booms and interceptions are scary to hear. But #lifecontinues and Ze ma sheyesh the hairdresser tells me – this is what we have – with a shrug, a wry smile and pain in his eyes. The Red Alert rocket app on his phone beeps again. Yes. This is what they have here, in this beautiful, tiny country almost entirely surrounded by enemies and hatred – not only on its borders but throughout the world. Two minutes in the bomb shelter in Herzliya is all day for the kids in the south, where the rockets fly too often and the 15-second window of safety is too small to risk corralling 50 little ones into a shelter over and over and over again. So this is what they have. What they have is 13 Israeli soldiers killed in three days. Brave, heroic soldiers with wives and parents and children of their own, who are on the ground in Gaza protecting not only our children, protecting not only Israelis, but also the Palestinians from themselves. As those soldiers fight to the death, the Israeli Defense Force has established a field hospital on the Israel-Gaza border to treat wounded Palestinians. So bitter. So sweet. I am here just for the summer. There’s nowhere I’d rather be than right here right now. It’s a crazy way to spend the summer and I could never have imagined it. But it’s an even crazier way to live, every day, every year, from babyhood and beyond. Summers are for doing everything you want, and nothing if you don’t. Summers are for fun, and for carefree, for wind in your hair and sand in your toes. Not for bomb shelters and falling rockets and getting used to the deafening wail of the sirens. Summers are for too much screen time playing Wii and Xbox. Not for rocket alert apps and websites like israelhasbeenrocketfreefor.com (20 seconds and counting – it’s reset twice in the last 30 minutes). And there is not a child nor an adult in all of Israel that does not know a summer like this. That is a crazy, unimaginable, unfair way to live. The road to Jerusalem is quiet. The bright orange letters on the overhead traffic signs tell drivers what to do when a siren is heard: Stop safely on the side of the road. I switch the dial on the radio. My favorite song pours out of the speakers. My eyes well as the gentle melody streams over me. My heart lifts a little and I start to sing along. 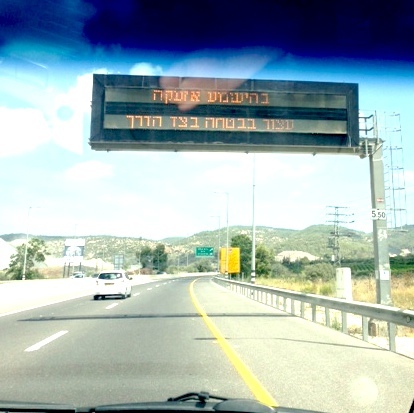 “Siren in Ashkelon… siren in Ashkelon,” comes the announcement over the music. Not once or twice. But over and over and over again. The tears cascade down my cheeks. The words freeze in my throat. My heart breaks into a million pieces. For this tiny country and its blessedly unyielding army, protecting its borders, its people, no matter what. Year after year, decade after decade. For the children spending the summer in bomb shelters and not in the park. And for the children who have done so too many times before and who will again. A crazy, unimaginable way to live. This entry was posted in Exploring Israel and tagged #Dan13, Al Kol Eleh, honey, Israel, Israel Defense Force, kids, music, Naomi Shemer, rockets, shelter, song, summer, tears by Nicki. Bookmark the permalink. Thank you for sharing your gift of the written word. Oh Nancy… I feel like I’m watching the person I love most in the world, deal with the most heroic but excruciating pain. If we are all one (which I truly believe) then Hamas is like a cancer within us we have to kill to stay alive. The operation (and the chemo and the radiation) is pure pain and makes us sick, and some of us will die in the process, but if we have faith we are healing, we will overcome and live, perhaps an even more meaningful life, though scarred forever. Beautifully written, and so precise. You made me cry! I heard your favorite song at the end of this sermon ( which is a good sermon) around 21:00, thought you might enjoy. Your words resonated with me. A bit of an Oakland connection too, that’s Rabbi Strauss, formerly of Temple Sinai seated behind Rabbi Buchdahl. I lived vicariously through your blog /Fbook of your travels. Thank you.